The first national signing day for Mike Locksley as the full-time head coach at the University of Maryland came with a pleasant surprise. COLLEGE PARK, Md. 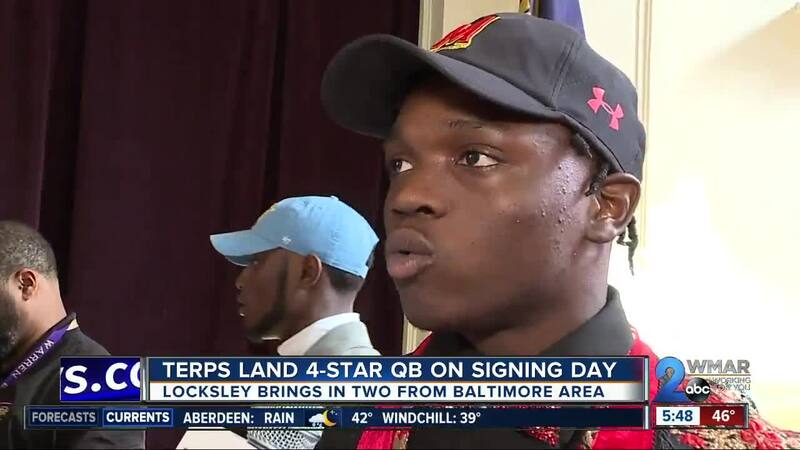 — The first national signing day for Mike Locksley as the full-time head coach at the University of Maryland came with a pleasant surprise. Four-star quarterback out of New Orleans, Lance LeGendre, picked the Terps over his other finalist, Florida State. LeGendre goes 6-foot-2, 205 pounds and has a chance to start as a freshman this fall. As for the rest of Maryland’s signing class, it was largely put together since Locksley finished up his offensive coordinator job at Alabama last month. Of the 17 players, nine are on defense, eight are on offense, and two are from the Baltimore area. Deonte Banks is a defensive back from Edgewood High School. “He is the epitome of a D.M.V. (D.C.-Maryland-Virginia) player. If I had saw his film at Alabama he would have been an Alabama recruit,” said Locksley of Banks. Malik Jackson is a 6-4 tight end from Meade High School. “His ability to get open in space and his matchups against linebackers and his ability to finish and catch the ball really jumped out on tape,” said Locksley of Jackson. As for the scandal surrounding the death of former Terps player Jordan McNair, Locksley said that during recruiting he didn’t wait for players or their families to bring it up. He broached the subject. “We didn't try to shy away or hide from it. We addressed it. It didn't even need to come up from the parents,” said Locksley.